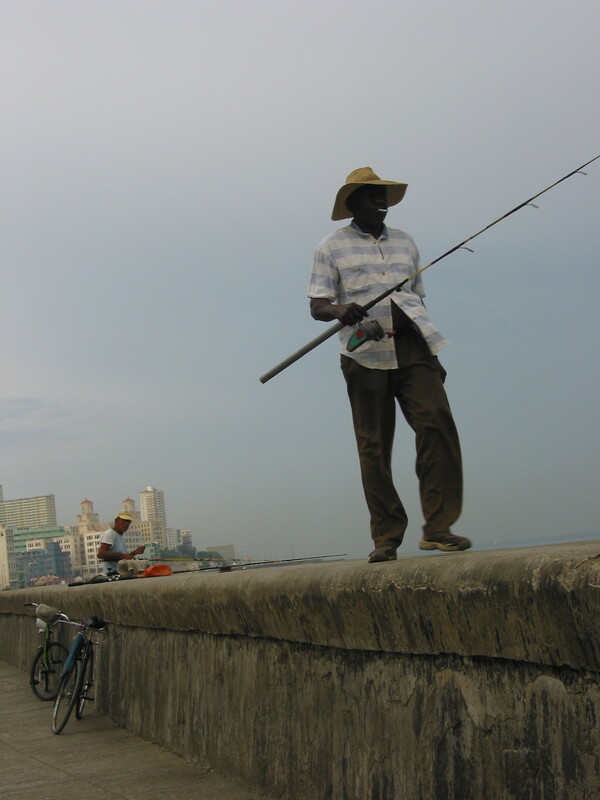 A decade ago I was riding along the Havana Malecón in a white and blue ’57 Ford with a four-cylinder Toyota engine. The taxi driver overheard my companions speaking English in the back seat. “Where you from?” he asked in Spanish. “Both proud?” I asked, recognizing the outlines of a familiar conversation. Such encounters always make me smile. It’s a rarity anywhere in the world to be liked for being an American, and I have to admit: it feels good. It’s one of the reasons I keep going back to Cuba. Between 1999 and 2004, I visited the country frequently on a special educational license from the U.S. Department of Treasury’s Office of Foreign Assets Control (OFAC). The longstanding U.S. prohibition against Americans traveling to Cuba had begun to loosen a bit, and everyone you talked to – American and Cuban – was convinced that the embargo would be ending soon. Fast forward to today. The embargo still stands, and the Cuban people still love Americans. On a recent visit to Havana I shook the hand of an old man in a convenience store, beaming, affable, and drunk. “Cubans and Americans are just the same, except Cubans are hungrier,” he remarked. “Which is why I’m so skinny.” He lowered his chin to indicate his bony frame. Many Cubans are skinny, because even with the government-issued ration books that keep people from starving to death, it’s impossible to put together a month’s worth of three square meals a day. Most people appear lean and healthy, hungry but not malnourished. Those who work in hotels, rental agencies, and other tourism-related businesses are better fed, even chubby. Before we said good-bye, the old man asked for a convertible peso (C.U.C. ), and I didn’t hesitate to give it to him. He may have been a drunk, but there was no question he needed it more than I did. Whether the average Cuban’s nagging hunger is due more to the ills of a command-and-control economy or the stifling chokehold of the fifty-year American embargo appears to be an open question. A high-ranking officer at the U.S. Interests Section – which serves as our unofficial embassy in Havana as the Cold War drags on in this strange time-warped corner of the Caribbean – recently assured me that the embargo doesn’t matter. “It’s not like they can’t buy their goods from other countries,” she pointed out. True enough, I suppose. But think about the economic stimulus that might be created by allowing free commerce between this island nation of 11 million people and a market of 310 million of the world’s wealthiest people, whose nearest beach is less than 90 miles away. The hordes of high-tipping tourists alone would create a major shot of adrenaline for the Cuban economy. Barring a major shift in U.S. politics, however, such an economic sea change does not appear imminent. Despite it all, Cubans go on loving Americans. I find myself shaking hands with every taxi driver, every impromptu tour guide and street musician, every artist or fisherman or mechanic who takes the time to explain the make-do ingenuities of Cuban life. The Cubans you meet in the course of a day are so generous with their friendship, so eager to help, to facilitate and enlighten, that you feel you are in the company of close cousins, indulgent aunts and uncles. The director of an arts foundation in Havana recently explained the roots of the Cuban-American affinity. Before 1959, Cuba was more Americanized than any other country in the world. American corporations had satellite offices in Havana, and there was an undersea telecommunications cable that ran across the Straits of Florida. As a child in the 1950s, the foundation director remembers eating at the Woolworth’s lunch counter, living in a house stocked with the latest American products, and watching Gunsmoke and I Love Lucy on TV. The streets of Havana are a living museum of vintage American cars, but the relationship goes deeper than that. Cubans of a certain age, he pointed out, almost feel like Americans themselves. This is one reason the “reunions” that take place multiple times a day when Americans travel to Cuba are so warm and emotionally charged. On a recent trip I stayed in a casa particular, a government-sanctioned private home serving as a bed-and-breakfast. This casa was a sixth floor apartment in a 1950s building, nicely furnished with the well-used American period furniture and appliances common in Cuban houses, with views over the pleasantly leafy Vedado neighborhood down to the Malecón, and to the blue Gulf waters beyond. My hostess, Olga, has lived here since 1963. A professor at the University of Havana, she loves to talk, lecture, tease, banter, and surprise you by offering ways of looking at things you haven’t thought of before. She’s expressive and gracious, often reaching out to touch you mid-conversation to stroke your chin or squeeze your shoulder. Her voice is deep and gravelly from too many years of smoking. As a teenager she participated in Fidel’s youth brigades, sent out into the countryside to educate the campesinos. Havana is glorious, mesmerizing, simultaneously joyous and sad. It’s one of the few world capitals I know where you can see the moon and stars at night. Exquisite architecture, much of it badly in need of paint and renovation, lines streets that seem poised to explode at any moment into violence or dancing. Strangler figs slurp the ground with roots that slouch lazily upon each other like boneless fingers, or time-lapse tribes of sleep-deprived worms. Finned American cars from the 40s and 50s combine nostalgia and menace, showcasing Cuban defiance and resourcefulness and taste. Little girls do surprisingly accomplished handsprings on the beach; highly talented musicians frequent every restaurant and square; boxers spar in run-down courtyards; taxi drivers have Ph.D.’s; and the waitress in your neighborhood paladar may well be a poet, a dancer, and a moonlighting doctor, all at once. Decades of privation have honed Cubans’ special talent for making the best of what they have. In Havana and elsewhere on the island, you’re always running into amazingly skilled people: mechanics, academics, doctors, artists, dancers, athletes, tour guides, inventors. In part this may be because there are fewer distractions, but it also springs from a pervasive cultural emphasis on creative excellence. People may be hungry, but they take pride in what they do. They spend many hours a day practicing it, and they do it well. This refreshing truth is another reason Cuba is such an inspiring place to travel. On one level, Havana has remained frozen in time on January 1st, 1959, when the corrupt ruler Fulgencio Batista fled in his private jet as Che Guevara, Fidel Castro, and their triumphant revolutionary cohorts made their final advance on the city. Antique Fords, Chevy’s, Pontiacs, and Buicks still dominate the avenues, and elegant mansions, most subdivided into multi-family apartment buildings, are literally falling apart around their inhabitants’ ears. At the Museo de la Revolución, which houses tanks, warplanes, and the yacht Fidel and Che used to return to the island from their military training in Mexico, you can see bullet holes in an old delivery van used in an attack on the presidential palace that is now home to the museum, and more bullet holes in the palace’s grand marble staircase. Hemingway’s house in the satellite community of San Francisco de Paula is just as he left it. His typewriter rests on a bookshelf, his spectacles on a side table, and the record of his daily weighing-in is scrawled in pen on the wall of the bathroom. On a recent trip I rode in a ’48 Dodge, beetle-black with a split windshield. The owner was a prodigious do-it-yourself mechanic, like many Cuban men. “It still has the original engine,” he said proudly, and that’s quite an accomplishment when you think about how much use it must have had over more than six decades. Most of the old cars have been switched over to Toyota engines. On another level, the entire country is a relic of the Cold War. Box-like Ladas, dented and street-worn but solid as war tanks, play second fiddle to the American classics, and ugly Soviet architecture – grime-soiled apartment blocks, abandoned factories and oil refineries – crop up in the most unexpected places, like the fruits of a latent Stalinist fungus attacking the ancient bones of the Spanish Empire. One more thing that makes visiting Cuba special: the feeling that you’ve entered a kind of grimy, rustic time warp. Change is underway, though, and beginning to accelerate. The government of Raúl Castro has recently been easing the economic laws; Cuban citizens are now allowed to operate private businesses, and to buy and sell cars and houses. Compared to just a year ago, there is palpably more commerce on the streets of Havana. There is a new sense of animation and possibility. Young people wear fashionable stone washed jeans, a burgeoning middle class patronizes a set of new stores and restaurants, and there are now as many modern cars on the streets as antiques. Despite these changes, it’s important to emphasize that most people’s finances remain dire. The ration books only go so far. Meat, eggs, and other essential proteins are a rarity on the majority of Cuban tables. A tip of one convertible peso is standard for watching a car, helping with a bag, or providing access to something mildly forbidden at a museum or a cultural site. It sometimes feels embarrassing to engage in such transactions with Cubans, who are among the most dignified people I’ve ever known. But it is, at least for the time being, a necessity. Many Cubans have long ago given up on making plans for the future. They live day-by-day, hand to mouth. “Sobrevivimos” is the common, stoical refrain: We do what it takes to survive. “I’m going to say how I see it, and forget the consequences,” one young man in the countryside told me, having hitched a ride in a rentacar I was driving. “This government is not for us. It exists for one person only.” He made a familiar hand gesture, a quick stroking of an imaginary beard: Fidel Castro, also known as “tu tio,” your uncle. This young man earns a salary of twelve convertible pesos a month, about what it costs for one tourist to sit down for a restaurant meal. If you visit Cuba, I recommend renting a car and setting out on the autopista nacional, the national highway vectoring eastward from Havana into the heart of the island. Driving the Cuban countryside is a beautiful and at times surreal experience. The scenery is achingly picturesque: tall palm groves fading into the green distance like something out of the Land of the Lost; little hardwood fincas painted blue or pink and surrounded by flowers; stunning Caribbean tableaux of well-tended cane fields and jungled limestone hills. Then you round a corner and come face to face with the massive concrete buttresses of an abandoned Soviet factory, and you remember where you are. At least by outward appearances, not much has changed since the fall of the campo socialista in the early 1990s. With the demise of the Soviet Union came an end to ambitious infrastructure projects such as the autopista, most of which is still in excellent shape, in part because it sees so little traffic. On a recent trip I spent a few days at that landmark of U.S.-Cuba relations, the Bay of Pigs. In a small museum you can see some of the thinly disguised U.S. warplanes that were shot down by the Cuban army, and you can stay in an ugly cinderblock resort run by the state. The food is terrible. A kind of malaise prevails among the workers in this and most other state-run resorts. They tend to be well fed, harried, inflexible, and sour – the very opposite of most Cubans you encounter in the street. But the seawater in the Bay of Pigs is limpid azure. Healthy coral heads teem with fish. There are sponges and waving sea fans, and polyps like miniature palm trees that shrink back into the rock if you wave your hand at them. It’s everything I remember snorkeling to be back when unbleached, untrammeled coral reefs were the norm in tropical regions around the world. Now they are rare, but it shouldn’t be surprising to find them in Cuba. Across the island there are unspoiled beaches, well-forested mountain ranges, and intact mangrove swamps serving as nurseries for new marine life. Chalk it up as an achievement of the Revolution – understanding also that there are benefits to fifty years of political and economic isolation. Cuba’s population is relatively urbanized, so much of the countryside feels, well, empty. Empty of tourists at least, once you get away from Old Havana, Trinidad, and the crowded beach resorts of Varadero. Will this atmosphere change if and when the embargo is lifted? Most Cubans I’ve talked to seem to have given up hope of that ever happening, and it’s easy to understand their perspective. On a recent trip some friends and I visited Trinidad, a Unesco World Heritage site for its remarkable concentration of colonial architecture. In Santa Clara, we stopped by the monumental black statue of Che Guevara that looms over the countryside like a throwback to the myth-making grandiosity of the ancient Mediterranean. We drove through Remedios and Caibarien, pretty colonial towns with spacious plazas that fill up in the evenings with strollers, hawkers, and various citizens eager to supplement their incomes with a few extra pesos. When the embargo ends, anything new – from iPhones to Hyundais – will be a huge temptation to Cubans. They will snap up such technology the moment they can afford it. This is likely to be particularly true of the Internet, which the state has thus far prevented from extending its tentacles as it has in virtually everywhere else, and which will provide for Cubans a craved-for opening to the rest of the world. If you go to Cuba, it’s worth taking a drive out the great causeway or pedraplen, 50 kilometers out over the Caribbean to the Cayería de Santa María, a complex of hundreds of coral keys supporting a vast ecosystem of mangroves, reefs, and sugar-sand beaches. When the causeway was built, the government had apparently planned a Varadero-style development, but when I visited in 2002 it was a quiet paradise, with only two hotels and plenty of breezy Caribbean solitude. That year we spent an afternoon on one of the most idyllic beaches I’d ever seen, completely unspoiled, with the finest white sand imaginable, gently swaying coconut palms, and a vast natural basin of tepid seawater so clear you could almost breathe it. These days the Cayería is a little more built up, and access to that unforgettable beach is now blocked off by an expensive members-only hotel. But it still seems removed from the rest of Cuba out here, a quiet Caribbean paradise of the kind that is increasingly difficult to find. It’s a good place to end a trip to Cuba, and to reflect on what the future holds. When the embargo ends, how much will Cuba change? Will you still see the old Chevy’s and Oldsmobiles on the Malecón? The ubiquitous Ladas, the putt-putt coco-taxis, the ancient tractors and bicycle taxis and horse-drawn caruajes? More importantly, will the Cuban people maintain their special character? Their resourcefulness, talent, and hard won dignity? I think they will. Perhaps it will be easier to buy familiar products, and there should be a lot more variety in available food. But Cubans are too independent to become completely bewitched by our culture of McDonalds’ and iPhones. Hopefully, they’ll apply the same ingenuity to this new bounty of capitalist exchange that they’ve applied to five decades of economic isolation. Contrary to what some might expect, the Cuban Revolution is too ingrained to come crashing down the day Fidel dies. The Revolution permeates the municipalities and the ministries, from tourism to agriculture and education and beyond. It’s not just the Castro brothers, though it is important to understand that for most Cubans they and the Revolutionary compatriots they have outlived are analogous to George Washington and Paul Revere to Americans: founding fathers who have reached the plane of the mythological. Cubans are proud of their Revolution. Does this mean they don’t bemoan their current economic state, and aren’t tired of so many years of non-democratic, one-party rule? No. Most Cubans I’ve talked to, even the more “revolutionary” ones, long to see more freedom, more openness, and, emphatically, more economic opportunity. But that doesn’t change the way they feel about the Revolution itself. Not only what it has accomplished in health and education, but its heroic David and Goliath character – its proud history of standing up to the colossal enemy to the north. Fortunately for those Americans who want to travel to Cuba – and I hope that all Americans will soon have the unconditional legal right to do so – Cubans are good at making distinctions between a government and its people. Meanwhile, assuming there is a transition to Western-style free-market capitalism, it is likely to be gradual and incomplete. Perhaps Cuba will become a kind of miniature Caribbean China, with state control of social services and infrastructure and a vibrant, prosperous private sector. It is reasonable to hope that these proud people will keep hold of the undeniable progress they have made in health, education, and social welfare, even as they gain the freedom to travel, assemble, speak freely, and provide for themselves and their families. But in the end, whatever happens, Cuba will still be Cuba – like nowhere else in the world. This article originally appeared in Empirical magazine and won a 2012 Solas Best Travel Writing Award from Traveler’s Tales. If you’re interested in traveling to Cuba independently or with a small group, read this first.